Today was Tristan's 2 month check-up. 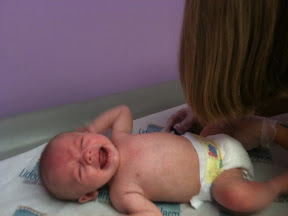 He weighs 10 lbs 1oz, which is in 10th percentile, while he is 21 1/2 inches long which is 10th-25th percentile. In other words, we have a perfectly proportionate little man who at this point takes after his momma. He also had to get the dreaded shots today. I really wasn't worried about it because he has already had labs drawn twice since we got out of the hospital. I think once your newborn has had a collapsed lung and IV's in his hand and head, you can handle most anything. It is amazing how strong they can be. He looks pretty healthy to me. Good set of lungs?